Replenishes moisture throughout the home and maintain a proper humidity level to make it more comfortable. Water-saving technology which uses 30% less water than standard models. PerfectFLO water distribution tray optimizes efficiency and water usage. Perfect for homes with an area up to 4,000 sq ft. Installation Kit included - all components you need to install this humidifier is provided. Easier installation with fewer duct connections and less wiring. Flow-sensing pressure switch and shut-off damper, easing the installation process for homeowners. 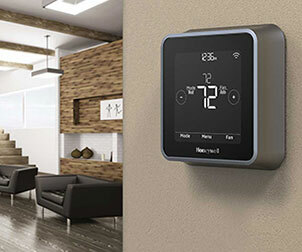 Utilizes home's HVAC system for whole-home humidity distribution. Easy mounting on either warm air supply or return air duct of forced-air furnaces. Less maintenance and cleaning than portable units. Protects wood floors and furnishings from drying and cracking. Saves money and energy - improved humidity means the thermostat can be turned down a few degrees. 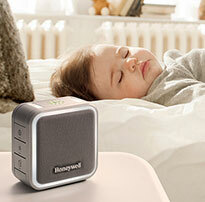 Easy-to-use Honeywell humidity control included. 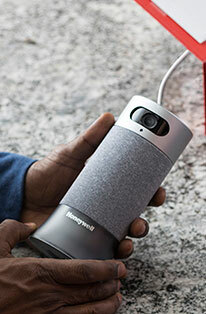 Adjust your home's humidity levels accordingly with the accessible and efficient Honeywell Whole-House Humidifier. The HE280 Humidifier comes equipped with built-in water saving technology that uses an impressive 33% less water than standard module humidifiers. This is achieved with the correct usage of a PerfectFLO water distribution tray that optimizes efficiency and water usage. This unit requires notably less maintenance than competing models and carries the bonus incentive of saving you money and energy. Installation is a near effortless procedure as a set of detailed and easy to follow instructions is included with each unit. This model is ideal for homes and can cover a range of 4,000 sq ft.
*Please be certain to check for available space prior to installation. 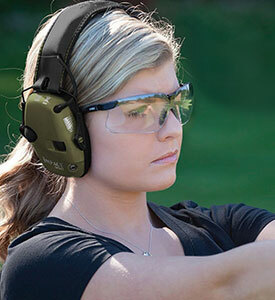 The HE280A2001/U's dimensions are as follows: HxWxD (in.) 16.25 x 18.5 x 9.75. Dimensions: (HxDxW): 16.25 x 18.5 x 9.75 in. Plenum Duct Opening (WxH): 9.75 x 12.625 in. Recently installed the Honeywell humidifier. I'm very handy and the installation was fairly straightforward. The hardest part was cutting the ductwork on the furnace. I had to install the unit on the return side due to lack of space on the sending side. Make sure to switch pressure switch hoses otherwise the humidified won't work found out the hard way. The only criticism is the hook -up for the electric to the solenoid is not very clear . The picture in the book is small and hard not detailed. Figured it out thorough a little trial and error. Been running for a week and got rid of the static and dry atmosphere of the winter. The item was shipped quickly and received in good shape, the shipment was complete, the description was perfect, the installation was easy, everything is working just fine, what more can you ask for? Fairly easy to install. Seems to be working well. Has maintained our desired humidity level, even during a sub zero stretch of weather. Very happy with this unit, installation was pretty easy and instructions easy to follow. The hardest part is actually cutting the metal duct work. Seems to be much better quality and thicker plastic than an Aprilaire unit my parents had. No mess inside as the water seems to stay within the filter panel and drains out the bottom easily. Very happy with this purchase. Humidifier was easy to install, working well so far been in 2 weeks. Installation video was a great help. Good company and very good service.